Midgley surrendered the lead to Washington’s Austin Thom with just 9 laps to go. Oregon’s Kole Raz grabbed the lead from Thom a few laps later and drove onto victory. “It was like they (Farrington, Thom and Cole) were shot out of a cannon,” exclaims Midgley, “we all had fast cars tonight. 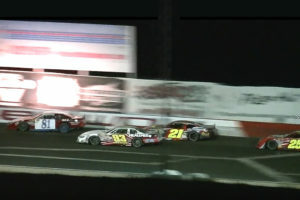 We were so close to getting it done here tonight.” Midgley’s fourth place was his best ever finish at Tucson Speedway. His previous best finish in Arizona was 5th back on November 23rd. Next race for Team NPP is at Wenatchee Super Oval in Washington State on April 27th. SIDENOTE: Victoria, BC’s Dave Smith was making his debut in a Team NPP race car Saturday night. Smith backed his Shockwave #5 Dodge into the wall during practice Friday afternoon. Damage to his race car was extensive. Midgley offered the Team NPP back-up car to Smith. The rookie Super Late Model driver and veteran road course racer drove the NPP/Alien Race Cars #81s Dodge to a 17th place finish in the first Feature and a 12th place finish in the second Feature on Saturday night.